At the recent London Bullion Market Association annual conference, the consensus opinion on the gold price for 2019 among 682 industry delegates was $1532 per ounce. The LBMA offers its opinion annually and it usually falls on the conservative side of the ledger. So its consensus opinion of an average price more than 25% higher than the trading range at the time came as a surprise. “This is the most bullish forecast since 2012,” said Ruth Crowell, chief executive of the organization which includes bullion banks, financial institutions, miners, and refiners. At the time of the meeting, stock markets were gyrating, the latest emerging country crisis was reaching a boil and geopolitically the global financial order was more precarious than it had been in a long time. Gold's safe haven role was back on the financial pages. A few days later, the World Gold Council issued its quarterly assessment of physical gold market. Demand for gold coins and bullion, the category that tracks private investor interest, was up 28% over the third quarter of 2017. "Stock market volatility and currency weakness," read the report. "also boosted demand in many emerging markets. China – the world’s largest bar and coin market – saw demand rise 25% year-over-year." Central bank demand, another closely watched indicator of global interest in the metal, was up 22% over the previous year. "This," said the Council, "is the highest level of net purchases since 2015, both quarterly and year-to-date, and notable due to a greater number of buyers." In short, the World Council was reporting the strong business flows among the LBMA's professional community that fueled the bullish predictions. These gold artifacts were found along with a portrait of Confucius, perhaps the oldest known. Wisdom and gold make easy company. Confucius once said something that has current applicability: “In a country well governed, poverty is something to be ashamed of. In a country badly governed, wealth is something to be ashamed of.” Or at the very least, well-hedged . . . . . . . .
Has inflation returned to the United States? We have alluded to the possibility of tariff-driven inflation in the past in this newsletter. Rising import prices – the result of de-globalization, e.g., the U.S.-China trade war – will filter ultimately to consumers. This will not be a monetary inflation but a political inflation and a different animal from anything we have encountered in the recent past. As such, we are entering uncharted territory – one in which politics could outweigh monetary policy in dealing with it. We got some evidence of inflation's potential return to the United States in the October wholesale inflation report. Prices were up .6% from September to October – a 7.2% annualized gain and the biggest gain since 2012. Producer prices, as shown in the chart below, have pushed steadily higher since 2013. Some argued following the report that this increase should be dismissed as a one-time event. Ignored in those arguments was another statistic of more than passing interest: The core index, which excludes food and energy, was up .5% – or 6% annualized. As might be expected, in this whacky, upside down Alice-in-Wonderland financial environment, the gold price counter-intuitively turned down on the day the government released the report. The market took the report, we were told, as justification for further Fed tightening. More complex arguments about the Fed's policies including the inflationary deployment of excess reserves and the still negative real rate of return (despite the run of rate increases) were pushed aside. In a financial environment in which good news for gold is interpreted as bad news, and bad news is still bad news – the day-to-day headlines might seem nearly irrelevant in determining the future price direction. Along the way, though, we suspect that the clock will stop running backward – rising inflation will come to actually mean rising inflation, and not something else, and rising inflation will come to mean higher gold prices. 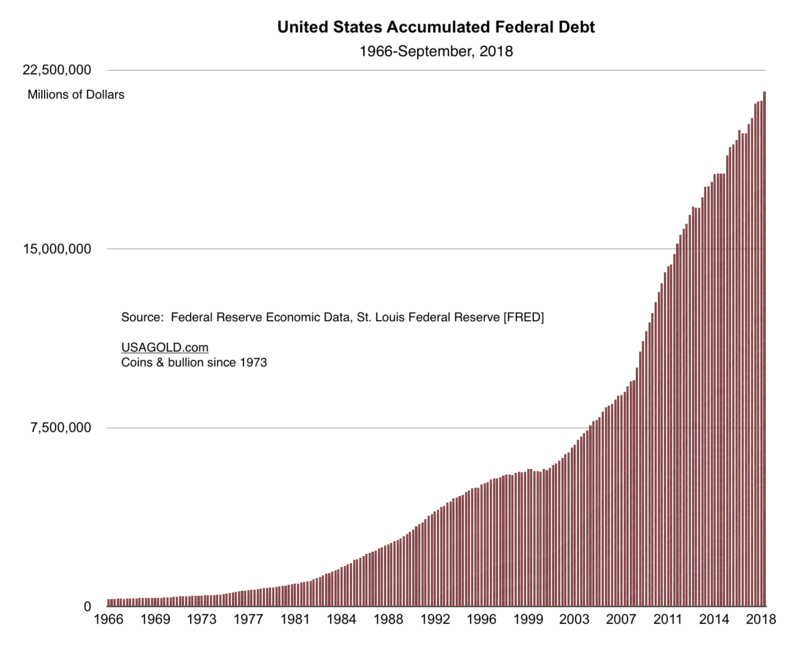 Who owns the U.S. public debt? And what does it have to do with the price of gold? Popular belief holds that foreign investors and central banks hold the lion’s share of the nearly $22 trillion federal debt. These charts from the St. Louis Federal Reserve tell the real story. Though it has not always been the case, private domestic investors now hold the largest share of the national debt at $13.1 trillion. Foreign investors are number two at $6.2 trillion. Federal Reserve banks are number three at $2.8 trillion. 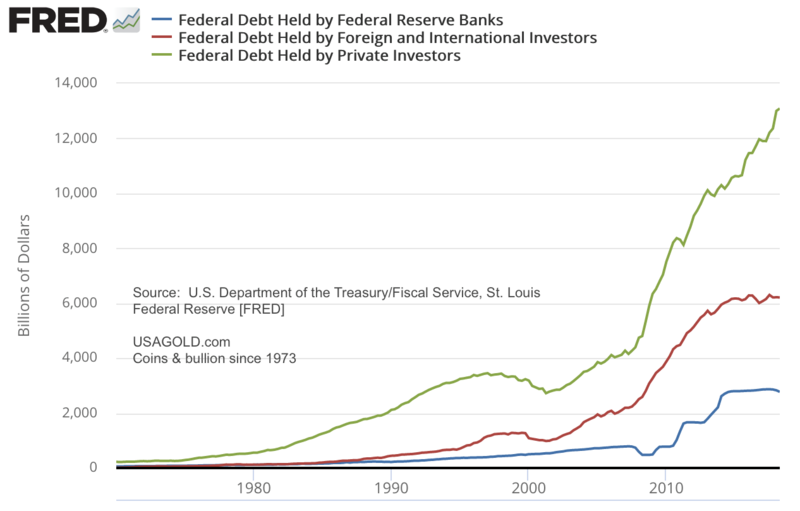 As you can see, federal debt held by private investors is on an ascending curve while both foreign and Federal Reserve banks’ purchases have leveled off. At present, private investors hold more than half the national debt (59.3%) as shown in the pie chart at the very top. Foreign investors hold 28.1% of the U.S. federal debt. Both China and Japan, the two largest foreign holders of U.S. debt, are essentially defending their currencies and attempting to thwart capital flight. How that shakes out in the global foreign exchange markets remains to be seen but their intent seems clear. The financial media sometimes mistakenly promotes the notion that the reductions are related to the trade war, but once again, that simply is not the case, Japan has held their foreign exchange reserves steady since 2012 and China began reducing its reserves in 2014. In short, neither have been buyers of U.S. Treasuries in the aggregate for quite some time. So what does all of this have to do with the price of gold? In short, Japan and China, at least for now, are not complicit in driving their currencies lower against the dollar. Any future weakness or strength, it follows, will be market-driven – a posture that undermines the strong-dollar/weak-gold narrative. At some point the algo-driven speculators might be forced to give up on attacking the yuan and yen. In turn, they might be forced to give up attacking gold; and, in fact, begin covering their short positions on the COMEX. As it is, we have begun to see some unwinding in those positions of late for both gold and silver. This analysis from James Rickards, in our view, is his most important in a long time. Financial warfare – the ability of America’s enemies to penetrate and disrupt markets and infrastructure through malware and other forms of electronic weaponry – is something few investors contemplate. As Rickards, points out though, the threat is very real especially under the current tension-filled circumstances and prudent investors need to take it into account. “The key,” says Rickards, “is to have some portion of your total assets invested in non digital assets that cannot be hacked, wiped out or disrupted in financial warfare. Such assets include gold, silver, land, fine art and private equity that is usually represented by a paper contract and does not rely on electronic exchange trading for liquidity.” This is the financial market equivalent of living off the grid. We strongly recommend reading and contemplating the article at the link. Editor's note: When asked how it all plays out and if there is anything that he sees as safe in a global financial system on the verge of another crisis, Taleb says he owns “some gold, which I am confused about, and land. . .” He does not elaborate on why he is confused about gold. Taleb, as most of you already know, made his mark in the financial world by predicting the 2007-2008 crisis and writing the now famous book, The Black Swan – The Impact of the Highly Improbable. From the International Advisor: “Conservative high net worth gold investors prefer physical bullion over ETFs, says State Street Global Advisors. Private banks in Asia mainly use ETF vehicles when making active bets on gold based on a short-term outlook, Robin Tsui, gold ETF strategist at SSGA, said during an event in Hong Kong. For strategic allocations or longer-term investing, buying physical bullion and storing it in a safe remains the norm.” The same is true in the United States and Europe. Financial institutions and funds tend to favor the ETFs while private investors tend to prefer coins and bullion stored nearby. Editor's note: The same is true in the United States and Europe. Financial institutions and funds tend to favor the ETFs while private investors tend to prefer coins and bullion stored nearby. Editor's note: The allusion to fashion reminds us of the old maxim that an ounce of gold from time immemorial would always buy a quality man’s suit. “The price of a fine suit of men’s clothes,” says the U.S. Geological Survey, “can be used to show anyone who is not familiar with the price history of gold just how very cheap gold is today. With an ounce of gold, a man could buy a fine suit of clothes in the time of Shakespeare, in that of Beethoven and Jefferson, and in the depression of the 1930s.” At present, a quality men’s off-the-rack suit at Brooks Brothers without the shoes and tie ranges in price from $1700 to $2500. The world’s largest gold nugget is 61 lbs, 11 oz and is on display in Las Vegas.